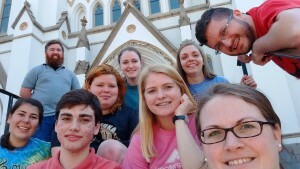 On Sunday March 13th, the UNG’s Catholic Campus Ministry took the Mobile Missions’ bus on a trip to Savannah, Georgia for a Spring Break Mission Trip. For those of you who don’t already know, the bus has been completely overhauled and renovated by our campus minister and her husband, Jaime & David Roberts (who run the Mobile Mission Ministry). There are benches that line the interior walls, making it convenient to talk, have fun, and even sleep during a road trip. We made it down to Savannah in about six hours after two stops: one for gas and one for food – but really they were both bathroom breaks. We arrived at the Villa Maria Center, a Catholic retreat center run by the Diocese of Savannah and maintained by Sister Pat. The center was beautiful and had a dining hall, large commercial kitchen, a pool house with showers, a chapel, fire pit, dock, and fields to play soccer, badminton, and volleyball on. The sun had set on the first day of our trip to Savannah, and we all prepared our sleeping spots, either in the dining hall or on the bus. All of the girls claimed the bus, and as we got into our sleeping bags and hunkered down for the night, we talked about our dreams and aspirations. On the next day, we awoke at 7:15am. Rising and shining was not easy, but we got dressed and headed down to the chapel to do MorningPrayer together. 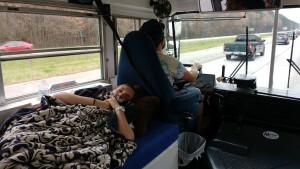 We then got back on the bus to drive to St. James Catholic Church for their 8:30am Mass. When we walked in, I’m confident that we lowered the age average by at least a few years. The Mass was short and the parishioners were welcoming and friendly. We got back on the bus and headed back to Villa Maria to change into play clothes for the day and to enjoy a hearty breakfast together, cooked by the one and only, David Hunter. 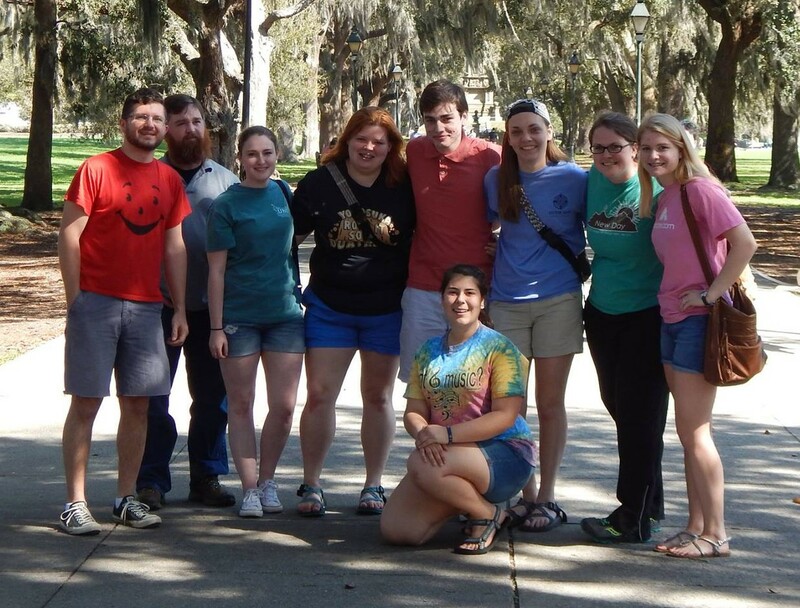 We then got back on the bus to head to downtown Savannah to explore the city we were there to serve. 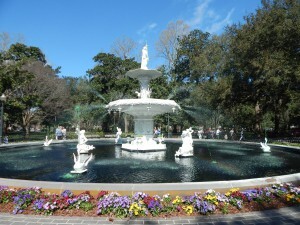 We walked through Forsyth Park and up and down the beautiful streets of the city. 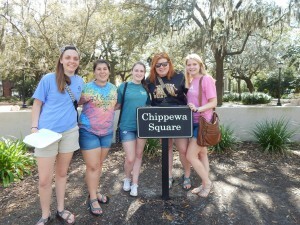 We explored some of the grassy squares, saw the spot where Forrest Gump was filmed sitting on a park bench in Chippewa Square. 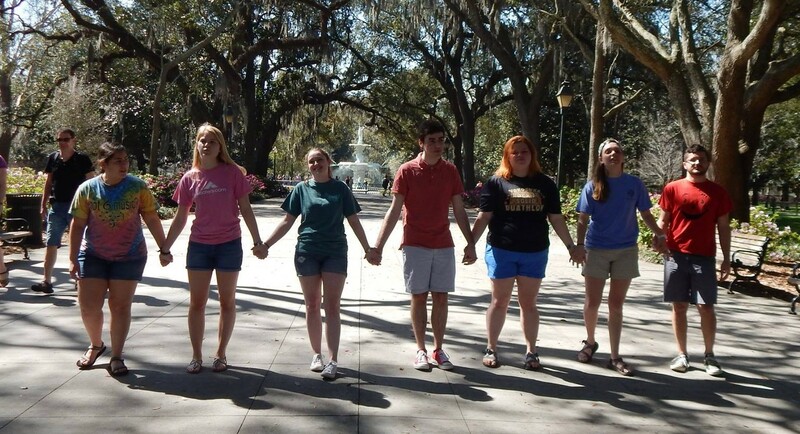 We used the restroom inside the SCAD welcome center, took pictures outside the front of the cathedral, and we took a stroll down River Street. We ate lunch at Tubby’s, a restaurant that overlooks the river, and then walked back to the bus to go to Blessingdale’s, the thrift store where we would do our mission work. This store funds The Living Vine, a Christian Maternity Home that houses pregnant women that have nowhere else to go. They also host a yard sale every month and split the proceeds with local youth groups who volunteer and help the yard sale. When we arrived to Blessingdale’s, we got the grand tour of the chaos we were being thrown into. 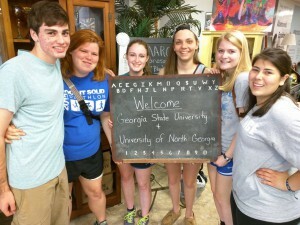 The thrift store had a few other college groups who were volunteering there for the week also. We jumped right in with them. Some of our group was in the processing center, where the donations are dropped off to be sorted later. 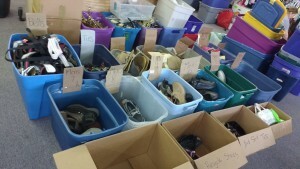 There were countless shoes to be sorted into pairs by gender, sizes, and how they should be sold (either in the thrift store or into a yard sale pile.). The other part of the group was brought to an annex storage facility with cold water and ice for the group that had been there all day. There was no air conditioning and the volunteers who were there looked like the ice and water we brought was an answer to their prayers – looking back on it now, it probably was. 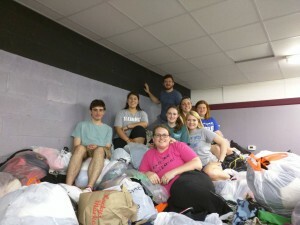 Those of us on that trip finally made it back to the processing center to help sort, not only shoes, but also housewares, small appliances, décor pieces, and clothing. The men of the group used their muscles to move the heavy furniture and trash items. We closed down the shop at 6pm and made it back to Villa Maria, our temporary home. We played games together and had a delicious dinner together. We took turns taking showers in the pool house and counted down the hours until we could sleep. Tuesday started just the same, Morning Prayer in the chapel, then off to St. James for 8:30am Mass. This time Mass was celebrated by a different priest than the day before. We talked with a few parishioners afterwards who were interested in what we were doing and how we were helping their community. One lady even donated $50 to us for our efforts (which we donated to The Living Vine Maternity Home). After Mass, we went back to Villa Marie to change and eat another breakfast, and we also made and packed our lunches for the day. We then walked out the door and onto the bus, as we left for Blessingdale’s. O ur group broke off again and many of us went back to sorting shoes, and the other half went to the back room of the store. You see, the store has always been at this location, but they had just recently secured the warehouse building next door to use as their processing center. 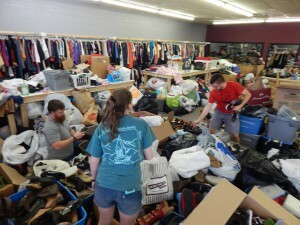 There was almost no good working system for them because as soon as they could put stuff onto the shelves to sell items, 100’s of new donations were being dropped off. We were really able to leave them in much better shape than we had found it when we arrived. Those of us in the back room group put some stuff out on the floor to sell and then the real work started. We wiped down the pollen-covered shelves, and moved them so they were all together. We moved, boxed, and organized tools that the store uses. Lunch came and we could finally sit down and eat on the bus while talking about all the work we were doing. We were on an amazing journey of self-discovery because while we cleaned and organized we were also helping people who could not help themselves. 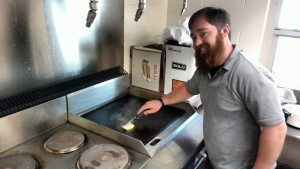 We quickly got back to work and continued the tasks we were given. After 6:00pm, we got back on the bus, exhausted and happy. We made it home to shower and play games. We set up some tents and hammocks this night too. We had built an amazing community among ourselves – we laughed about inside jokes and were making new ones. We built a fire and cooked hotdogs for dinner, then prayed the rosary together to close out the day. Wednesday started with Morning Prayer and Mass again before breakfast and heading back to the thrift store. All of the workers who were there were so grateful, but to me, it really did not seem like that big of a deal. I just saw this as sharing the time and talents we had been given with people whom we might not ever get to meet. I saw it as an opportunity for growth. We finished the backroom and the shoes, and we were given different tasks, like taking down tables, fixing the clothes racks and putting more clothes out. We worked the tedious jobs that I’m sure the ladies at the store were glad they had people to help do. We wiped furniture and trinkets, and put tags on pins and earrings. At the end of the day, we took a moment to shop and buy some things from the store as well. We invested some of our money into the shop we had spent so much time improving. We also got to share the Mobile Mission bus with the ladies at the shop to show them how cool it is. We prayed with them before leaving, maybe to never return or see the fruit of our labors, but we know we helped them and that’s all we could ask. After leaving Blessingdale’s for the last time, we went to Leopald’s, a famous ice cream parlor downtown. We had prayed that we would get a good space in line because on Monday we saw that the line was wrapped outside the building. Our prayers were answered – there was no line at all when we arrived! The ice cream was just as good as the company we shared it with. 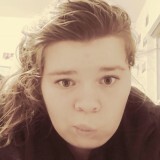 We made it back to Villa Maria to shower, play games, and grow closer to one another in our conversations. We built another fire and had dinner around it again, before closing the night out with another rosary. Because it was our last night together, we tried to keep our eyes open as long as possible and spend more quality time together into the wee hours of the night. 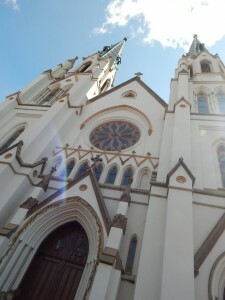 On Thursday morning, we had to wake up much earlier in order to say Morning Prayer and make it to a different church for an 8:00am Mass at the Cathedral downtown. The parking was atrocious because of it being the St. Patrick’s Day parade. We finally found a spot and hiked over 20 blocks to Mass. The Cathedral was packed to the brim with a sea of green Catholics in preparation for the big parade. The Mass was said by the Bishop of Savannah, and there were close to ten other priests on the altar to help celebrate Mass. The homily was said by an Irish priest, and his words made me want to go to Ireland and see the beauty and the seminary there. There were photographers taking pictures throughout the Mass, which in all honesty, made me feel a little awkward, but we got through it. After Mass we trekked back to the bus and headed to Tybee Island. On the way to Tybee, we noticed how many of our other friends were in Savannah for the parade, but I was thankful for not being in the chaos. We made it to Tybee and hung out on the beach. The weather was nice, but the water was cold. We played frisbee and talked about the future, and tried not to think about the fact that our time together like this was almost over. We got back on the bus and went to Villa Maria. We packed and loaded up all of our things. We swept and cleaned the areas we used, and then we loaded on the bus and headed home. 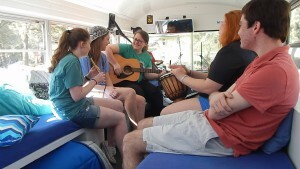 The bus trip was filled with music from a guitar, a djembe drum, and an authentic tin whistle. Laughter filled the air, as did the heavy breathing of sleeping people. 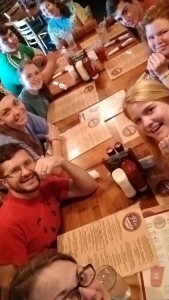 We made it back to Dahlonega and grabbed food before sharing our goodbyes and going our separate ways. We started great friendships on this trip and we were able to share our talents with those who needed it. While we may not see the fruits of our labor during our time serving in Savannah, we still served God and shared him with everyone we met.